Price reduced on this beautiful used 75' Sunseeker yacht for sale! : Atlantic Yacht & Ship, Inc. The price has been reduced on the 75′ Sunseeker that Randy Kires has for sale! In the first place, recent interior an exterior refit works have been completed. Therefore the vessel boasts a perfect history of service and maintenance. Correspondingly, brand new audio and visual equipment were all fitted in 2015. In fact, this results in the latest and greatest options. Not to mention that in 2015 this used 75′ Sunseeker had a complete refit. This included the NAV electronics suite on both the upper and lower helms! As can be seen, her Cherry wood interior combination is perfect. After all, the light colored carpets and contemporary furnishings is a natural combination. This yacht has very high class specifications from new. And this used 75′ Sunseeker is quite simply the most attractive on the market. This yacht is turn-key and ready to go for the summer. This yacht was built to MCA compliance for further comfort and security, . So, you know you are on a sea worthy vessel. 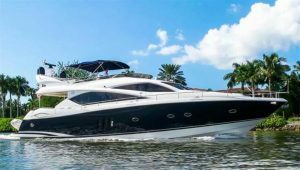 For more information on this beautiful used 75′ Sunseeker yacht for sale in Florida be sure to contact Randy Kires today! This is the best value on an used 75′ Sunseeker yacht for sale!